Was lucky to get break in the clouds to view a daytime crescent Moon and Venus come together April 22, added bonus... clouds, in just the right amount to add atmosphere. 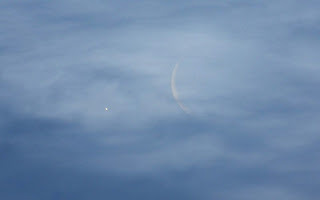 They, the clouds rolled back in just before the occultation, that is when the Moon actually covered Venus, but a daytime conjunction of the Crescent Moon and Venus is still a pretty picture. 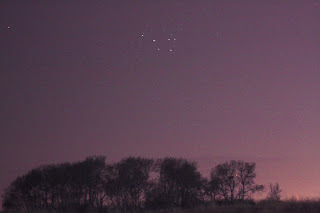 That's not all, the Pleiades and little Mercury were and are as we speak also in conjunction very cool. 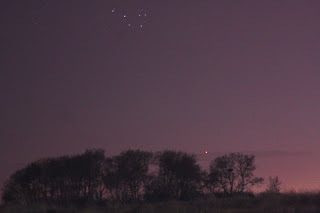 Click on the conjunction link above, it is the best description of a celestial conjunction ever, a conjunction is basically a temporary close gathering of two or more celestial bodies. To see the conjunction look to the west about an hour after Sunset, you'll see Mercury, as it will be the brightest object in the lower west sky, just above Mercury will be the Pleiades. They will be getting closer together till April 30, at which time they will start pulling away from each other, and drawing closer to the glare of our Sun, grab some binoculars if you can, the Pleiades are awesome through them. From conjunctions to cats. When I first pulled up to the Marsden Hotel , where I was staying for the meteorite search, a cat ran up to me and rubbed against my legs...hey what can I say, some guys are chick magnets.... I'm a cat magnet, they love me , I love them. 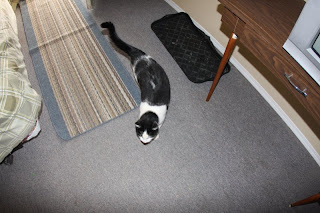 Anyways, 7 am the next morning there was a meowing at my window, the town cat was back, I let her in and we had tea, and surfed the net before the meteorite search, that's right, the Marsden hotel had high speed wireless internet technology. I have been concerned about whether or not I'd be able to find wireless in China so as to post from there.... well if Marsden has wireless in their hotel, population 294, I'm pretty sure they have the technology over in Shanghai with a population of 14.6 million, I'm hoping in their Hotel rooms. I'll leave you now with an animation of the Mercury/Pleiades encounter. I would like to take this opportunity to thank Ellen and Lynne for organizing the Great Prairie Meteorite search for the University of Calgary, they both did an excellent job. 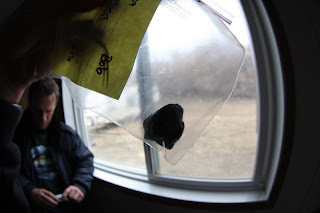 People from all walks of life across Canada were there hoping to find a piece of the Buzzard Coulee meteorite that fell just south east of Lloydminster Saskatchewan November 20 2008. 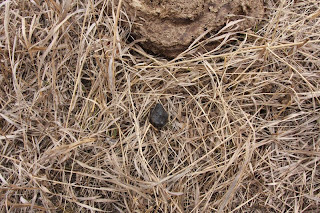 The image above is my first ever meteorite find, it was a thrill and an experience I will not soon forget, BTW it is the black stone just below the poop. 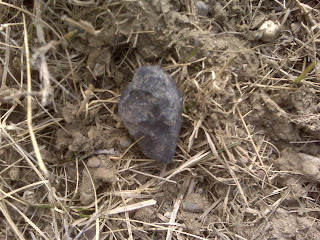 My first ever meteorite find documented and bagged. We all lined up in teams and walked slowly across a field looking for a meteorite, noted astrophotographer and writer Alan Dyer was one of the people on my team. The above image is my second find, to think it's been sitting there just like that since November 20 last year, you can see it starting to develop rust, the elements taking their toll. 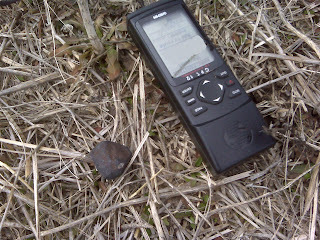 The above image is my third and final meteorite find, again words can't described finding these rare rocks from space. 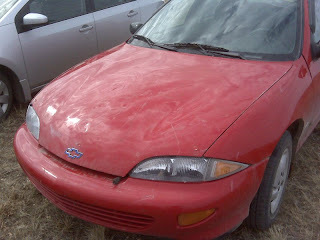 You are probably wondering why I have a picture of the hood of my car in this post, well it had just been hoofed by a Clydesdale Horse, that's right, try explaining that to your insurance company. We were out searching for meteorites in a field when one of the team members noticed a gang of Clydesdale Horses, around 25-30 of them congregating around our cars, one of them started kicking the car hoods, who knew they do that sort of thing. So being real smart we started walking towards them, surely they'll disperse and run away, well... they ran alright, right towards us, before we knew it we were surrounded, these are huge animals close up let me tell you. There were mixed emotions in the group, some were petrified like moi, others were trying to make friendly with the horsesees, hello...... we just saw one attack our cars, I attribute the wanting to make friends to the Stockholm syndrome. Finally we all started slowly walking away from them and they finally left. I'll leave you with a few short clips I put together of my unforgettable meteorite/ horse encounter adventure. While I'm getting ready for my Buzzard Coulee meteorite search I thought I'd throw together some images for my latest post, images of cool stuff I've been doing but didn't really know what to do with them, so I thought group them together all in one post. The image above is my latest Micrometeorite, taken about a month ago. 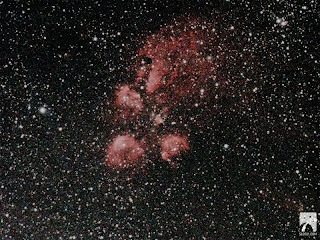 Image taken with my Celestron Digital Microscope at 200x. The image above is a Sigma Leonid meteor taken last night, this shower generally has a peak of 1 or 2 an hour, kind of boring unless you're going out to try and image one, like me. 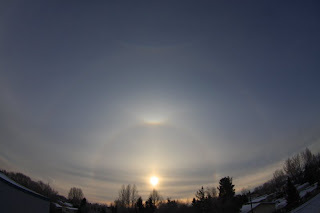 Was lucky to capture another double halo with circumzenithal arc from the roof of the mall I work at a month or so ago. 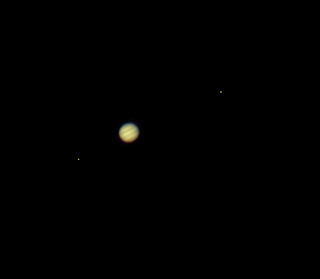 What Jupiter looks like through an average amateur astronomer type scope, looking through charts for the date this image was taken, the moons appear to be Callisto and Europa, Europa being the closest to. 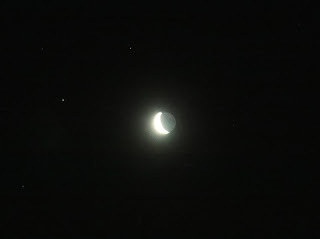 Image above was taken March 8, the conjunction of the Beehive star cluster in the Constellation Cancer and the Moon. Last but not least, I'd thought I'd throw this one in. It is one of my first images taken with my new Camera before I got a telephoto lens. 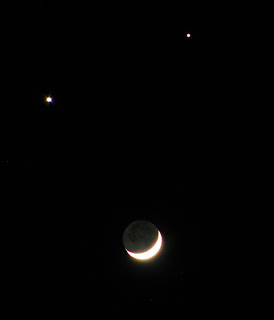 It is an image of a Moon Antares conjunction February 2008, the second dimmer star is omi sco, in the constellation Scorpius, reminds me of the Lunar Venus Jupiter conjunction of December 1 last year which Priyank got a shot of, image below. 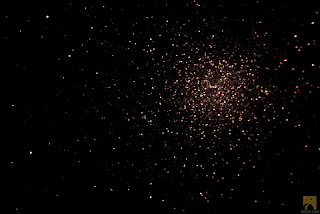 I'll leave you now with a couple blended images done in photoshop, then animated, one of a Moon Rise and one of my favorite Star Clusters, the Double Star Cluster in the constellation Perseus for my fantasy conjunction. Well I've gone and done it...... booked a room for a couple of nights at the Marsden Hotel. I will be joining a bonafide official search for pieces of the Saskatchewan Meteor that fell just South of Lloydminster last November 20, how cool is that? 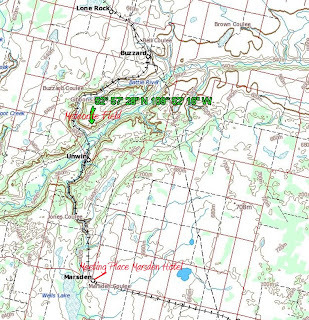 The search is being conducted by the University Of Calgary and are calling for volunteers, so if you happen to be in the area between now and the end of May...... and I really don't know why you would be, they have a place for you, a once in a lifetime chance to look for a meteorite. 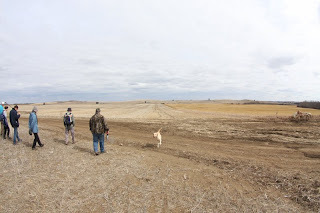 The search will be done CSI style, where you have up to 10 people in teams all in a line walking slowly across the field looking for the meteorite, they figure there are still thousands of pieces yet to be discovered, and I will be there taking pics for a future post. 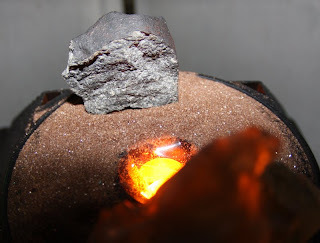 The image above is my Saskatchewan Meteorite on it's new stand, it goes round and round and shines a light on it as well, I like to watch it go round, till I get bored. 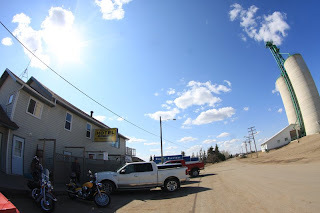 From meteorite search to meteor search, woo frigging hoo, after I finish my searching for the meteorite on Tuesday April 21, I will be heading back to Saskatoon to get ready for the peak of the Lyrid Meteor Shower. 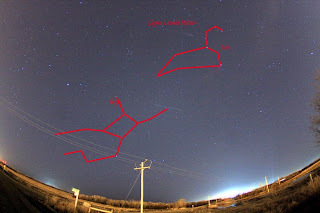 Look NE around 11:00 pm April 21 in the direction the constellation Lyra, if you don't know what the Lyra constellation looks like, don't worry, just look north east. 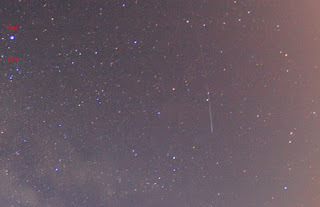 Not the biggest meteor shower, around 10-20 an hour, but it is warmer then the usual meteor showers, being in April and this time you won't have the pesky bright Moon to interfere, doesn't rise here till 4:30 am CST, just after the meteor shower peaks, around 2:00 am CST on the 22nd. But again, that's not all folks. After the meteor shower , or at around 6:39 am CST we have a Lunar occultation of Venus, that is, the Moon will cover Venus. If you live almost anywhere in North America, you will see the occultation, trouble being it will occur in the daytime, except on the West Coast, where the occultation occurs at twilight, so you will need at least a pair binoculars to view it properly, I will try to get some images of the Moon covering and then uncovering the Planet Venus for you if you miss it. Well there you have it, lots of celestial stuff going on, A meteorite search, a meteor search and a Lunar occultation of Venus, almost too much excitement for one person to handle. 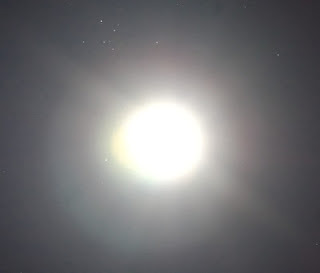 I'll leave you now with an animation of one of my creamsicle Full Moons. 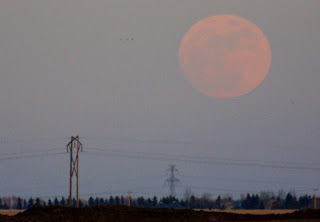 Hot off the presses, taken last night my April or Full Pink Moon. 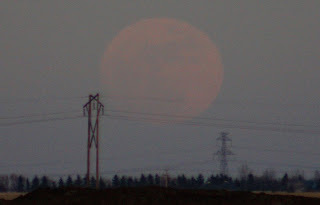 Called the Full Pink Moon due to the herb moss pink which is one of the earliest wide spread flowers of the spring. 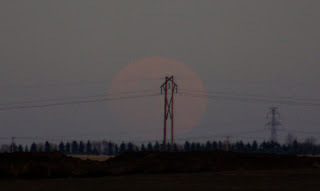 I was just about to put away my camera when all of a sudden the Moon burnt through the light cloud cover, I was looking in the direction of the Moon, and the whole thing just became, was really odd, from nothing to a Full Moon. Get this, after taken the images I headed over to the Shoppers behind me and got a creamsicle, the orange ones, I love creamsicles but haven't had one for like years, and it was cold out, just had a craving for one. Got home and downloaded the Moon Images and the first thing I thought of was creamsicle, the orange Moon and white cloud cover, here is the question, did the Moon and cloud cover lead me subconsciously in the direction of buying a creamsicle, or did I just think of a creamsicle Moon because I just bought one? Part of the International Year Of Astronomy 2009 was a cornerstone project call 100 Hours of Astronomy, which between April 2 and April 5th had a ton of online events where you could discover the Universe with the rest of the world. One of the coolest things they had , and you can still catch the recorded archived videos here, was Around the World In 80 Telescopes. 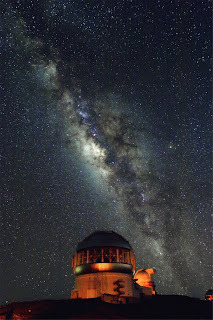 They had live broadcasts from the largest observatories around and out of this world. It was really interesting to see the different observatories and the people that make them work. Below Is a video, which I saw live, of the Shanghai Astronomical Observatory, which I will be touring in July with my visit to China. You know how it is, you get home after a hard day at work, flop down in your easy chair and turn on the TV, and you think, "Geez, I'd like to view 16 Zet hya in the constellation Hydra but I just don't want to spend the hour it takes to set up my scope" and then you think, " Wait a minute.........I don't even have a scope, I'm really screwed, I'll never be able to look at 16 Zet hya in the constellation Hydra". Well normally you would be screwed, but enter Slooh. For just 49.95 a year you get unlimited access to telescopes, LIVE in real time viewing, in the Canary Islands, Chile and soon to be Australia.... that's right I said Australia. 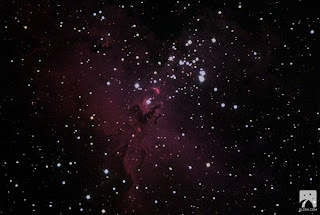 Choose between watching the programed tours of the live night sky or step in yourself and take control by way of booking the telescopes in 5 minute time slots where you are able to choose any object your heart desires, like 16 Zet Hya in the constellation Hydra, or something good like Omega Centauri, Image above. 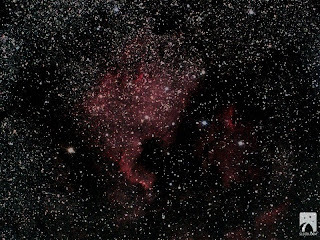 But that's not all folks, you have access to imaging equipment, where you can image your celestial target, as well as download it to your hard drive to use as wallpaper or post like I'm doing on the Internet, all this again for only 49.95 a year. They have a 7 day trial period where you can try before you purchase as well as a 14.95 plan where you can purchase 100 minutes of telescope time, either way if you are interested in viewing the night sky through a telescope, can't go wrong with Slooh, nothing like it anywhere else. I have been a member since 2004 and I have blogged about Slooh before, but they keep adding scopes and decreasing the price, thought I should give them another mention. This coming Friday, April 10 at 10 pm ET 400 Years of The Telescope will be airing on PBS. 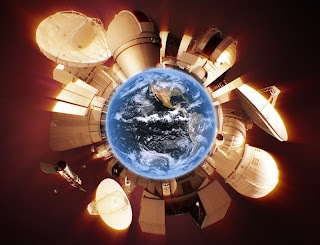 "The 60 minute film takes viewers on a breathtaking journey back to Galileo's momentous discoveries, through the leaps of knowledge since then, and to the future of colossal telescopes both here on Earth and floating in the cosmos." I'll leave you now with the trailer, looks pretty good.